Chojun Miyagi was born in the district of Higashi-machi, Naha, on 25th April 1888, second son of a local aristocratic family of wealthy businessman dedicated to the import/export business. His father Chosho Miyagi was owner of 2 ships which made regular trips to mainland China. Miyagi began his study in Shuri-te Karate at the age of eleven, in the dojo of Ryuko Aragaki (1875-1961). But it was only at the age of 14, in 1902, that he became the student of Naha-tee’s Master Kanryo Higashionna (1851-1915). It was under the tutelage of his Master, that Miyagi underwent a very long and arduous period of training, along with his colleague Juhatso Kyoda (1887-1967). Like his teacher before him, because of his great natural talent and fierce determination, he amazingly progressed. The training was very severe and beyond belief, with a lot of running and strength exercises. It is said that he sometimes passed out performing Sanchin kata, so demanding was Sensei Higashionna on his student’s performance. In 1910 he was incorporated in the army for two years were he studied judo and Okinawan sumo, different from the Japanese one. His attachment to the medical corps determined somehow his study of the physical aspects. Chojun practiced even harder with an enthusiasm unmatched by any of the other Higashionna students. Due to this enthusiasm Chojun Miyagi became “uchi deshi” (private disciple) of Kanryo Higashionna, with whom he studied until the death of his Master, 14 years latter, in 1915, developing himself into a powerful karateka. He continued to train in the methods he learned from Sensei Higashionna, always under severe and demanding conditions. He did not confine his training to the dojo, either. Every waking moment was spent in pursuit of his Masters art, always remaining vigilante to his surroundings, always planning and ready for whatever might occur. He made his first travel to China from 1904 to 1908, no doubt an opportunity afforded him by the nature of the family business, not to mention the luxury that wealth gave him in being able to pursue his art full-time. Chojun Miyagi, as successor to Naha-te pushed himself to the limits of endurance in his desire to emulate the extraordinary skill of his teacher. To this end, that same year (1915) he travelled to Fuzhou, Fukien Province, China. Fuzhou was the main centre of south-Chinese fighting arts (Nan Quan). His quest was to locate Master Ryu Ryuko, whom Higashionna had studied with. He was unable to locate him, though, but did pick up some of the local arts, notable the kata Rokkishu, which was instrumental in his creation of Tensho kata. Like his teacher had done he studied the martial arts of Shaolin and Pa Kua forms of Chinese boxing, to further his research. For two months together with his friend Aisho Nakamoto (1881-1945) he trained there and also visited the Julianshan Fujian Shaolin Temple. This was one of three trips he made to China during his lifetime. After two years in China, in 1917, he returned to Okinawa and opened his dojo out of his home in Naha. In Okinawa he became friend of two Fuzhou tea merchants Wu Xianhui (1886-1940), know in Japanese as Go Kenki, and Tang Daiji (1887-1937), know in Japanese as To Daiki (from Tiger Boxing – Hu Quan) both famous martial arts teachers. Wu Xianhui was in Naha since 1912 and came there to teach the White Crane boxing. Later, he also taught at the Okinawan Prefecture Police Training Centre, at the Okinawan Master’s Training College, and at the Naha Commercial High School (where his teacher had once taught). From the blending of these systems, the hard/external form of Shaolin, the other the soft circular/internal form of Pa Kua, with his largely Chinese influenced native Naha-Te a new system emerged. However, it was not until 1930 that Chojun Miyagi named the system Goju-ryu, meaning hard-soft style. In 1921, he was chosen to represent Naha-te in a presentation in Okinawa to the visiting crown prince Hirohito, on his way to Europe (that would become Emperor in 1926), and gave an impressive performance, among other masters of toudijutsu (China hand art). He repeated this in 1925 for prince Chichibu. He began to visualize the future of the Okinawan fighting arts, and in 1926, at the age of 38, set up the Okinawa Karate Kenkyu-Kai (Okinawa Karate Research Club), along with Chomo Hanashiro (Shuri-te), Kenwa Mabuni (Shito Ryu) and Motobu Choyo (Tomari-te), spending the next 3 years training in basics, kata, fitness and philosophy. Jigoro Kano (the founder of Judo) began visiting Okinawa in 1927, and was so impressed with Sensei Miyagi’s toudijutsu. Kano was particularly impressed with grappling, locking and throwing techniques and the correct use of breathing. Kano invited him, along with Mabuni, to Japan in 1930 and 1932 to demonstrate at several tournaments. It was at one of these demonstrations in Tokyo, in 1930, that his senior student, Jin’an Shinzato (1901-1945) was asked which school of karate he belonged to. Unable to answer (styles were only known by their geographical reference at that time), immediately, and imagining that a lack of name would be considered unqualified for his “naha te” he called his school “Hanko ryu” (half hard school). On his return to Okinawa he reported this incident to Chojun Miyagi. After much consideration, Chojun Miyagi chose the name Goju-Ryu (go – hard and ju – soft school) as a name for his style. This name he took from a line of the Chinese text “Bubishi”, a very popular historical reference, on martial arts and other subjects, among karateka of the day, in the Eight Poems of the Fists. (1. The mind is one with heaven and Earth 2. The circulatory system of the body is similar to that of the sun and moon 3. The way of inhaling and exhaling is hardness and softness 4. Act in accordance with time and change 5. Techniques will occur in the absence of conscious thought. 6. The feet must advance and retreat, separate and meet. 7. The eyes do not miss the slightest change. 8. The ears listen well in all directions). This line reads, “Ho wa go ju o tondo su”. It is necessary to point out that these precepts have a much greater importance than simply as the source for the naming on Goju-ryu. They present great insight into the indispensable knowledge and application of the sciences practiced by the martial arts masters of this time. Without proper and complete research and study of these paradigms, the true essence of Goju-ryu can never be truly understood. And this was the birth of the art of Goju-Ryu. In 1933 his toudi was officially registered as such at the Dai Nippon Butoku-Kai, the Japanese all Martial Arts Association. This was a milestone for karate as it meant that it was the first Okinawan martial art to be registered and recognized on a level with the highly respected martial arts of Japan. On the occasion Chojun Miyagi was given the honorific title of Kyoshi. It was the first master in Karate’s history to receive such honour. Chojun Miyagi worked hard to spread karate throughout Okinawa and mainland Japan, and to earn Naha-te a status equal to that of the highly respected Japanese martial arts of Judo and Kendo. To achieve this he travelled frequently to mainland, for some months to Japan where he was invited to teach karate, from 1928, at Imperial Kyoto University, Kansai University and Ritsumei Kan University. Thus Goju-Ryu Karate Do was the first and eldest karate form recognized by the Dai Nippon Butoku-Kai, allowing its founder to acquire an outstanding position in Karate Do history. 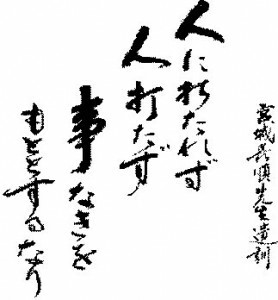 In the year of 1933, he presented his fundamental article “Historical Outline of Karate-Do“. In 1934, Sensei Miyagi was appointed as head of the Okinawan branch of the Dai Nippon Butoku-Kai Association, and in May he travelled to Hawaii to introduce karate there, were he stayed until February 1935. 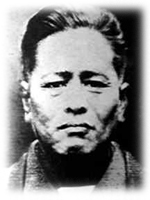 Introduced by Wu Xianshui, Chojun Miyagi met in February 1936, in Shangai, the famous Luohan Quan monk master Miao Xing (1881-1939), with whom he trained for some months as well as other masters associated with the Jingwu Athletic Association. In the occasion he also attended the national martial arts championship. On the 25th of October 1936 the well known Okinawa masters, Asatada Koyoshi, Chomo Hanashiro, Chotoku Kyan, Chokei Motobu, Chosin Chibana, Eigo Shio, Juhatsu Kiyoda, Kentsu Yabu, Mashiga Shiroma and Chojun Miyagi, assembled and changed the name toudijutsu into Karate-Do. Upon his return to Naha, he was awarded a commendation from the Ministry of Education for outstanding service in the field of physical culture and excellence in Martial Arts. In May 1937, prince Moriwasa Nashimoto recognised Miyagi the capacity to organise the Dai Nippon Butoku Kai Karate Jukkyoshi (the Association of Karate and Martial Arts Teachers of Japan). In 1940 he created the new katas Gekisai Dai Ichi and Dai Ni. The Allied occupation of Okinawa was a very turbulent time in the history of Okinawa and the art of karate. Many lives were lost, including one of Sensei Miyagi’s sons and his senior student, Jin’an Shinzato. He was forced to forget much of his training while his homeland was restructured after the war. In 1946, he was appointed director of the Okinawan Civil Association of Physical Education, and resumed his training, teaching the Police Academy and opening a backyard dojo, known as the Garden Dojo. Chojun Miyagi dedicated his whole life to karate, since he taught for many years. He was responsible for structuring Naha-te, later called Goju-Ryu, into a systemized discipline which could be taught to society in general. This teaching system which he formulated enabled karate to be taught in schools for the benefit of the young, and to reach vast numbers of people throughout the world. As a matter of fact until then no group teaching method was used (in spite of some popularization introduced by Higashionna and Itotsu). Predicting the future of Karate he has introduced “shi-ho kumite” (one against several opponents, the original “san dan gis”, “daruma taiso” (warming up and preparation for basical techniques: tsuki, ukes and geris), “Fukyo kata” (kata adaptation for physical education), “Heisho kata” (breathing kata: Tensho), hardening techniques of body and hands (“kaishu kata” and “kakie ohyo”) and relaxing exercises. Chojun Miyagi was a man of extremely mild temperament and it is said that he was a very humble man. He lived according to the principles of martial arts, that of non-violence. Master Miyagi died, of either a heart attack (the most popular explanation) or a cerebral haemorrhage at the age of 65, on Okinawa on 8th October 1953. He left undoubtedly a great legacy behind. He predicted that during the twentieth century karate would spread throughout the world. Today we can see that this prediction has been realized; karate is not only practiced in Japan, but it can be found throughout the countries of the world. “Do not be struck by others.